Seeing Berlin by bike gives you a whole new outlook on the city. Should I say that again? The best, and I mean the best, way to tour Berlin is by bike. This is why. 1) Berlin is one of the friendliest places in the world to cycle. The famous Copenhagenize Index that measures the world’s most cycle-friendly cities lists Berlin as No 8. Now that may not sound great but it has Berlin competing with some pretty serious competitors (Amsterdam ranks first, Copenhagen second…you get the picture). It has wide cycle paths, cars know to watch out for you and there are plenty of friendly cyclists around. 2) Berlin has plenty of bikes. You can rent them by the hour (or even just for a few minutes) using the awesome Call-A-Bike system run by the national rail company or you can rent a bike by the day or week from loads of companies. In fact most hostels and even a bunch of little corner cafes will rent you a bike. There are various tours through the city that will take you to most of the major sights or just through cool neighbourhoods. Popular ones include Fat Tire Bike Tours and Berlin Bike Tour. The most popular itinerary offered by Fat Bike Tours is their “all in one city bike tour” that takes in the main sites. These include Checkpoint Charlie, the Brandenburg Gate, a whiz along part of the Berlin Wall, a look at a watchtower, the Reichstag, and Museum Island among other sites. It takes about 4.5 hours to complete and costs €24 (or €22 for students and pensioners). It always gets rave reviews from visitors, mainly because of the amazing quality of the guides, who are just fantastic story-tellers and very knowledgeable when it comes to Berlin’s history. If you have a bit more to spend then you consider their e-bike tour. Seeing Berlin by e-bike is a totally different experience as you cover way more ground (about 23km in 5.5 hours) and see both sides of the city. This bike tour costs €45. 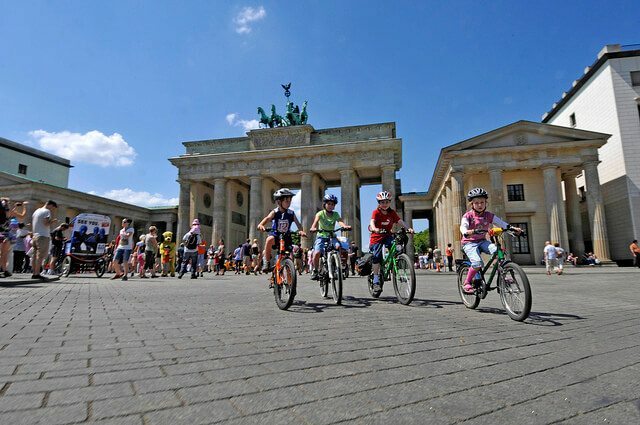 Slightly less well known that Fat Tire are Berlin Bike Tours, which also get rave reviews and offer a similar range of itineraries ranging from a tour of the Berlin Wall to the main sights in Mitte. If you don’t feel like peddling y you can get a tour on a Rickshaw with BerlinRikschaTours or get a ride on a cycle taxi. Last of all, after a hard day’s cycling you can get to drink a nice cool glass of Radler or “cyclist”, a mix of beer and something soft like lemonade.